Their extensive discography includes Ravel and Saint-Saëns for Resonus Classics; Philip Glass Head On; Korngold and Schoenberg (Verklärte Nachtarr. Steuermann) for Naxos; the complete Michael Nyman Piano Trios for MN Records; multiple releases on NMC, Delphian Records including portrait CDs for composers such as Luke Bedford and Michael Zev Gordon. Their recent release of French Piano Trios for Resonus was a Gramophone Magazine Critic’s Choice. 2017 saw tours of USA, South Africa, Zimbabwe and China, many festival appearances including a Schubert cycle at Kilkenny Arts Festival. Collaborations included new piano trio commissions from Kevin Volans and Alexander Goehr and a world premiere recording of two works by Philip Glass for his label Orange Mountain. 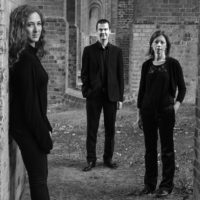 This year they continue their residency at the National Concert Hall in Dublin; a further tour of China and recordings of Gerald Barry’s Chamber Music for Mode Records and a second instalment of French Piano Trios (Chausson, Fauré and Satie) for Resonus Classics.